Do NOT underestimate the power of an old movie. After more than 50 years, Whatever Happened to Baby Jane? still delivers as one of the creepiest psycho movies ever, and as far as psychos go…Baby Jane Hudson is one at the top of the list. WHo else have you ever seen dancing on a beach with two strawberry ice creams while her sisters lies there dying?The audience is not given much of a chance to be on her side as from the beginning of the movie we learn through INDIRECT CHATACERIZATION all we need to know. Characterization is how a writer gets information to a reader about a certain character. Direct Characterization is when the reader is told directly about a character. For example, “She was the nicest lady in the county” tells us directly that a character is “nice.” It’s not very subtle and some readers like to make up their own minds about a character, so INDIRECT CHARACTERIZATION is another tool writers may employ. For Indirect Characterization…all you need to remember is S.T.E.A.L. ‘HOW’ a character says it. E=Effects on others How do other characters feel about them? What do they say about them? A=Actions How does a character behave? The beginning of Whatever Happened to Baby Jane? is jam packed full of INDIRECT CHARACTERIZATION. We are given a first impression of Baby Jane onstage as she performs sweetly to the applause of an adoring public. 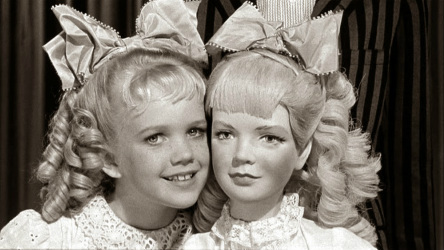 She is so cute that they even sell giant Baby Jane dolls with her dress and curls. Sister Blanche watches from the wings. It’s a nice introduction one of the few places in the film we are given a chance to actually like Baby Jane, but it is short lived as after the show, we see Baby Jane manipulating her father for ice cream in front of a lot of watching mothers and daughters who definitely pick up on her actions as revealing her character. The movie then jumps 18 years later and it is sister Blanche that is the big movie star who has to have a clause in her contract that for every picture she makes the studio has to make one with her sister Jane. Here is where we are given a ton of Indirect Characterization first from two men in a film projection booth. One says, “When the old man hired the Hudson Sisters, how come he had to hire the backend of the act too? 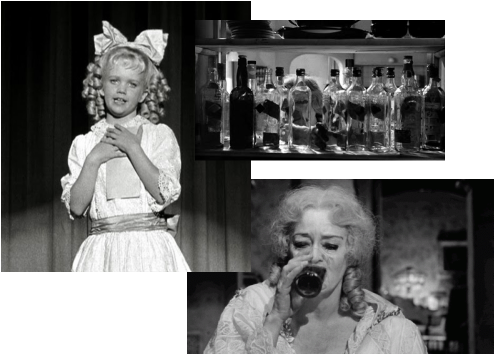 Boy, what a no-talent broad that Baby Jane is.” To which the other replies, “Why can’t she stay sober?” This gives us a big picture of the events of the last 18 years. The roles have reversed and now it’s Blanche that’s the big star and Baby Jane riding her coattails to cling to some of her former glory. But before we see Blanche as perfect, there’s some doubt as to her judgment regarding her sister when a man says, “She ought to have sense enough to know she can’t make a star out of Baby Jane again” to which the other man says, “Blanche doesn’t have any illusions like that, but she’s a nice person. She’s never going to forget those early years.” This sounds like a complimentary statement; however, in an example of another INDIRECT characterization of Blanche’s actions we know this may not be the case. At the beginning when she is standing backstage watching her sister…it’s NOT a look of adoration like the audience. And after her father snaps at her, Blanche’s mother tells her one day that she will be a star and asks her to never forget to be kind to baby Jane. The bityterr look on Blanche’s face as she says “I won’t forget” tells us everything we need to know that Blanche isn’t all goody two shoes. It’s really well done. 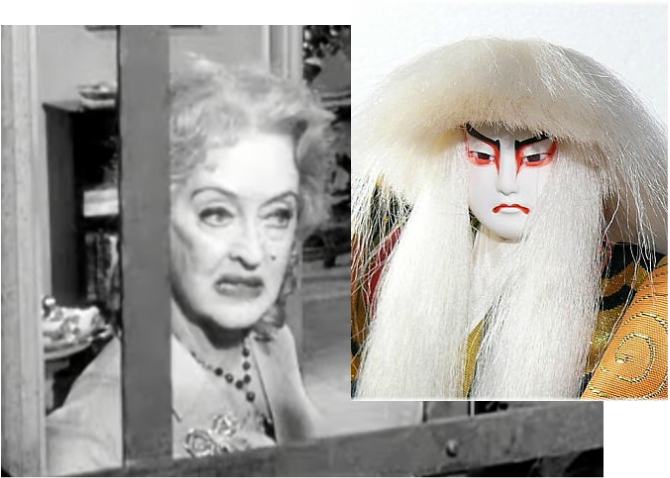 We are given two characters who appear to be opposites, sweet and spoiled, pretty and plain (Blanche is in pig tails at first), even their clothing and appearance is binary opposition: Blanche wears dark somber colors and Jane wears an ill-fitting white dress and what could pass for white kabuki make-up. Oddly enough at the end of the film we find out that the black and white color symbolism isn't misleading as we find out who the real villain is in the film. The whole movie is a joy to watch as its two stars go at it in a battle royale of acting skill, as well as an excellent example of how INDIRECT CHRACTERIZATION works on an audience. How does a writer give the reader information about a character?